Theresa May will face Tory MPs on Wednesday as she battles to save her premiership and her Brexit deal. The Prime Minister will address the Conservative backbench 1922 Committee as MPs consider alternatives to her Brexit strategy after seizing control of the Commons timetable. The prospect of MPs voting in support of a soft Brexit or second referendum appears to be winning some Tory Eurosceptics round to reluctantly backing her deal, but there has been widespread speculation that others might demand Mrs May sets out the timetable for her departure as the price for their support. Meanwhile, Mrs May was braced for further Commons revolts on Wednesday, with Cabinet ministers demanding free votes on the various Brexit options set to be presented and Eurosceptics poised to reject the domestic legislation delaying the date of the UK’s exit from the EU. The Government defeat on Monday night saw three ministers resign as 30 Tories rebelled to back Sir Oliver Letwin’s amendment to give MPs control of the Commons agenda in order to seek a Brexit plan which can command a majority. But Eurosceptics who have so far opposed the Prime Minister’s Withdrawal Agreement signalled they could now back it, with influential backbencher Jacob Rees-Mogg saying “the choice seems to be Mrs May’s deal or no Brexit”. Former whip Michael Fabricant said he had reached the same “dreadful conclusion” on Mrs May’s deal and a new prime minister would be able to negotiate a “better and more distanced relationship” with the EU after Brexit. It was “extremely unlikely” the deal would return on Wednesday but it would need to be held this week in order to guarantee meeting the terms set by the EU for the extension of Article 50 to the new Brexit day on May 22. Commons Leader Andrea Leadsom said the Prime Minister was having ongoing discussions “so that we can, if possible this week, approve the deal and guarantee Brexit”. 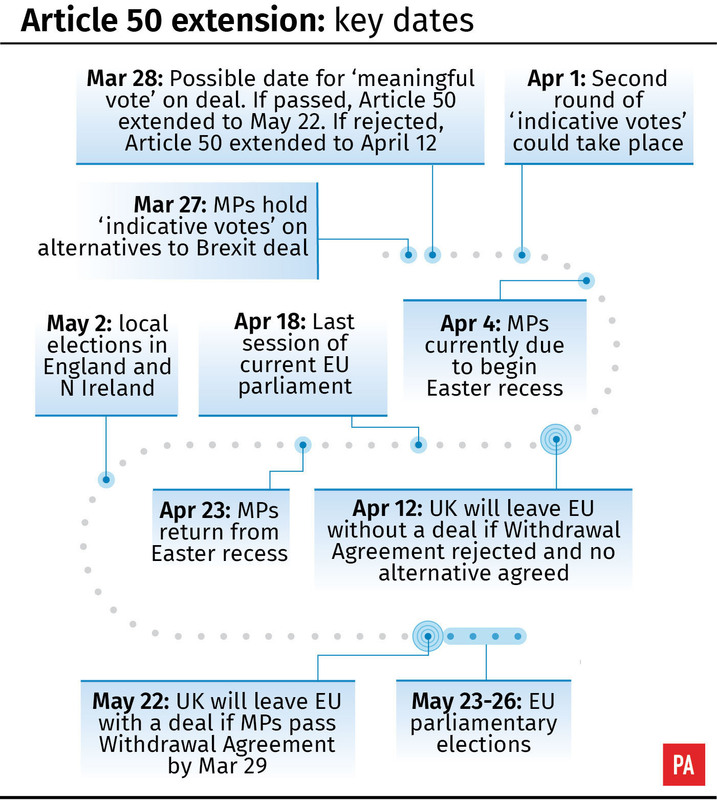 She also indicated that the Commons’ Easter recess due to begin on April 5 could be cancelled because time was needed to find a way forward or pass the necessary legislation for the deal and “the country will rightly expect Parliament to be working flat out in either scenario”. So far, the Democratic Unionist Party has given no indication it will end its opposition to the deal. DUP Brexit spokesman Sammy Wilson wrote for the Telegraph website: “There are some colleagues who I admire greatly and who have stood firmly with us in defending Northern Ireland who now take the view that the Withdrawal Agreement, even though it is a rotten deal, is better than losing Brexit. He suggested that a long extension to Article 50, keeping the UK in the EU, was a better option than the Withdrawal Agreement even if it meant leaving without a deal at the end. “Even if we are forced into a one-year extension, we at least would have a say on the things which affect us during that time and would have the right to unilaterally decide to leave at the end of that one-year period through the simple decision of not applying for a further extension,” he said. 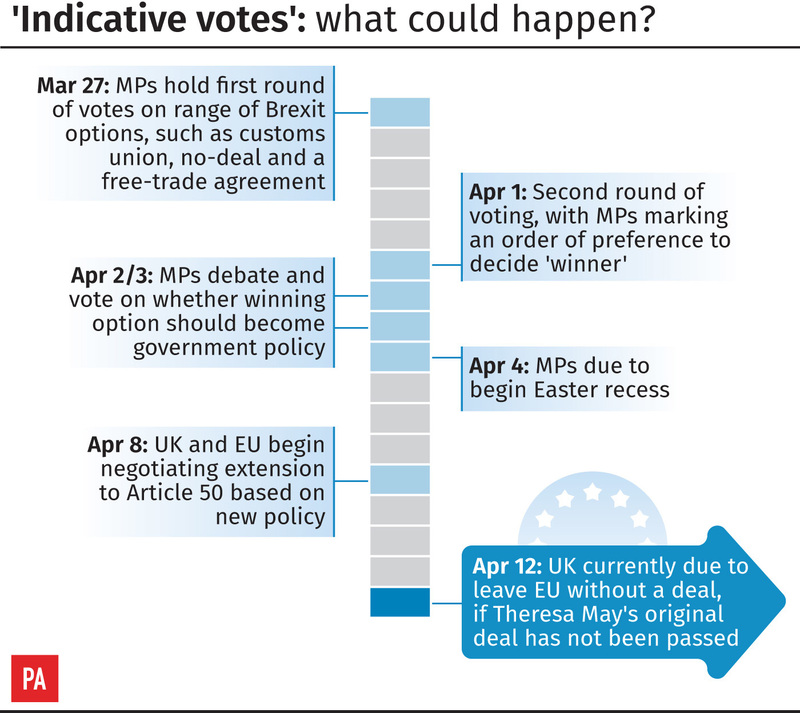 No decision has yet been made on whether the indicative votes on Wednesday will be whipped, despite Cabinet-level pressure for ministers to be allowed to express their views freely. Steve Brine, who quit as a health minister, suggested Mrs May could be forced to abandon her Brexit red lines. He suggested that Wednesday would see MPs vote on a piece of paper for as many of the options as they liked with a similar process on Monday in an effort to whittle down the number of options under consideration.